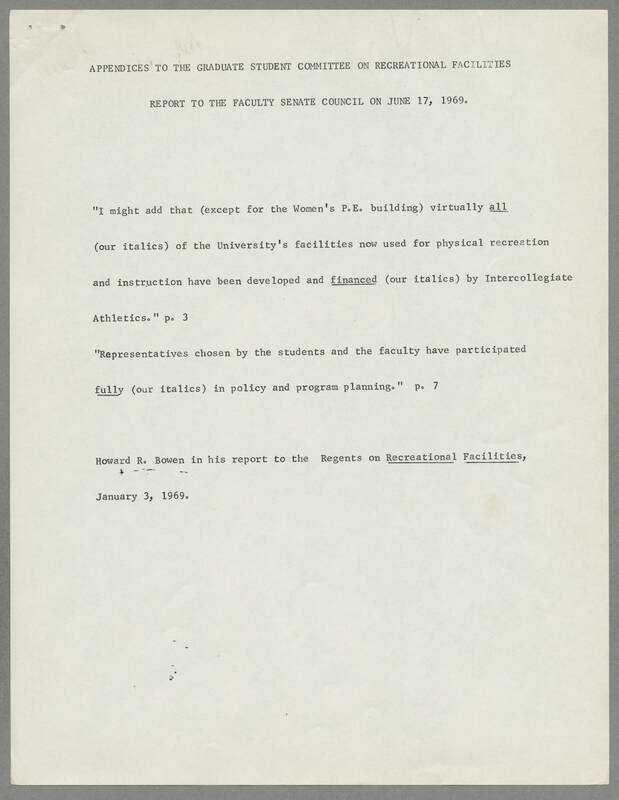 APPENDICES TO THE GRADUATE STUDENT COMMITTEE ON RECREATION FACILITIES REPORT TO THE FACULTY SENATE COUNCIL ON JUNE 17, 1969 "I might add that (except for the Women's P.E. building) virtually all [underlined] (our italics_ of the University's facilities now used for physical recreation and instruction have been developed and financed [underlined] (our italics) by Intercollegiate Athletics." p. 3 "Representatives chosen by the students and the faculty have participated fully [underlined] (our italics) in policy and program planning." p. 7 Howard R. Bowen in his report to the Regents on Recreation Facilities [underlined], January 3, 1969.